While mechanical keyboards have slowly become ubiquitous, not everyone has had a chance to try one out. For this article, we not only test out the latest keyboard from long-time memory company Patriot, with its Viper V760, we take a look at it from a new perspective – the perspective of someone who’s never used a mech before. Each of us at Techgage have our own area of focus but that doesn’t lock us into only working with a certain set of hardware. Nowhere is this more obvious than our coverage of mechanical keyboards. Over the past year, Rob, Tom, Jamie and Ryan have all taken mechs for a spin and the praise has been unanimous. Each of them left impressed with the keyboards they evaluated. I guess today is my turn. I’ve never typed on a mechanical keyboard before. Prior to using this Patriot Viper V760, my keyboard at both home and the office was a Logitech DiNovo Edge. The Bluetooth paired naturally with my MacBook and at home, the sleek and diminutive board has given my unorganized desk a somewhat elegant appearance. It doesn’t take much to do it for me. That said, the past few months I’ve spent every day with my first mechanical and I now have to distill those experiences into a concise and coherent review. 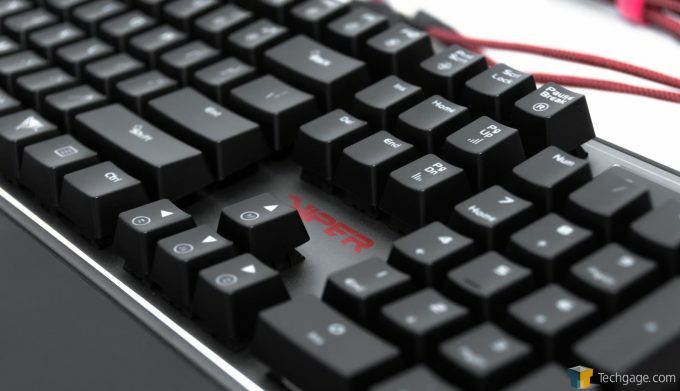 The Viper V760 offers users everything they’ve come to expect from a mechanical keyboard. Outfitted with an aluminum chassis, RGB lighting and individual key programmability, the V760 doesn’t stand out from the pack on paper, but it also doesn’t fall behind. Offering brown switches, manufactured by Kailh, the V760 is quiet enough when compared to other mechanicals using Cherry browns but I will say that compared to the DiNovo I’ve used for the past 6 years, there is certainly an audible difference. By doing a little research, the Kailh are identical to the Cherry MX switches. The same build specifications are used for both so those with Cheery MX brown experience should feel no different between the two switches. The keycaps are concave and soft to the touch. Pressing them provides the reassuring tactile feel that has been the hallmark of the mechanical market. The RGB LEDs under each key provide bright illumination and sit just above the switch under the cap. The USB cord that comes from the back of the V760 is housed in a red and black braided fabric, adding to the overall appearance of the keyboard. At the end, the cord splits into two separate USB plugs; one connecting the keyboard to your computer and the other connecting the USB port on the back of the V760 to the computer. This has been handy for me by allowing me to charge my phone at my desk. For others, it might be helpful to connect a gaming mouse. Whatever the use, the V760 provides one USB port in the top right corner of the keyboard. One feature that’s been hit or miss on other mechanical keyboards has been the addition of a palm rest. Some have it and some don’t. Thankfully, the V760 includes one. The palm rest is something I’ve gotten accustomed to having on my keyboards. The first keyboard I ever truly got excited about was the Saitek Eclipse II. It had a removable palm rest. To this day, that’s still my favorite keyboard. One nice feature of the palm rest on the V760 is the fact that it’s magnetic. Move the rest towards the keyboard and within half an inch or so it will snap in place. Thanks, science! Moving the keyboard around, including picking it up off of the desk, did not force the palm rest to separate. A violent jerk upward will cause it to fall, but normal movement won’t cause the rest to detach. The software included with the V760 is simplistic yet complete. While it lacks some of the features found in other keyboards in its class, the expected ones are all there. Lighting can be controlled, both color and intensity, as well as the desired effects. There are eleven effects in total to choose, from static to my favorite to show off, ripple. Any gaming keyboard worth its salt includes the ability to set and assign macros. While the V760 lacks dedicated macro keys, it does allow certain keys to be used to set off a string of preprogrammed inputs. It also allows macros to be looped for a defined number of cycles. Another feature of the Viper V760 software is the ability to control the report rate of the keys from 2ms up to 20ms. It seems that the most important features gamers would want in their keyboard software are present. Going into this evaluation, I wasn’t sure what to expect. My only experience with a mechanical keyboard was hearing their use by a handful of coworkers and friends. I’ve poked around on them at last year’s CES and when killing time at the local Fry’s. They’ve always felt good under hand but I have been content with the DiNovo for years. That said, Bluetooth can be finicky and a non-replaceable battery really give the board an uncertain shelf life. In the few months I’ve been working on the V760, I’ve loved most every minute. I put the keyboard through its paces by using it as a daily driver. Gaming with the V760 was enjoyable, but honestly, I noticed little difference. Once I’m immersed in a game, the peripherals I’m playing with are a distant thought so long as they’re working. That said, I’m not an avid gamer like I once was. My poisons are still RTS and single player FPS games, and rarely play any multiplayer online. For what I use the keyboard for, the V760 was and is a delight to work on. Tom’s been a great help in writing this review. Early on, when I first received the V760, he was a good sounding board. It was nice to hear what his preferences are and what he looks for in a good mech. That gave me a good bit to think about as I continued to use the keyboard from day-to-day. The build quality of the Viper V760 is solid, with very little flex when twisting on the ends. The added palm rest is a life saver for me personally and I see it being a nice feature for most who use the board. It being magnetic is an added bonus as well. I can’t begin to count the number of plastic clips I’ve broken over the years… even on my beloved Saitek. Possibly the best feature of the V760 is the price. Suggested retail for the V760 is $119 USD but it can be found most anywhere for just under $100. For a mechanical RGB keyboard of this build quality, that’s enticing. To keep things consistent, I purchased one for my office at work as well. I might not have done that had it been any more expensive than that. With the build quality, price, and features combined, the Patriot Viper V760 earns an Editor’s Choice award. RGB lighting isn’t unique to the V760, but it’s damn cool. Magnetic wrist pad is a nice feature. Kailh Brown switches aren’t overly loud but feel great.